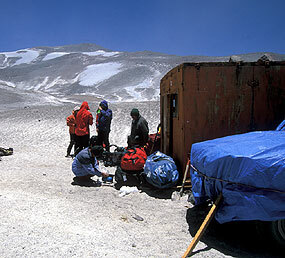 Berg Adventures International: 2004 Aconcagua and Ojos del Salado Expedition Cybercast. 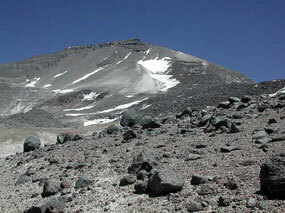 I t’s the 12th of January and I’m calling you from camp 1 on Ojos. What a great adventure we’re having, this feels like real unknown travel in a wild area; it’s 4-wheel drive travel. We took off doing shuttles in two crew cab 4-wheel drive pickups, Toyota pickups out across the sand flats with Ojos spread before us. We got closer and closer and we drove up now to the shelter of a moraine and we’ve got a beautiful camp established at 17,500 feet. You see a lot of various reports on the elevations of this area, my friend Ken, who we’ll know better soon, we’re going to be climbing together on Aconcagua with him. He was involved with some Austrians who did a survey here a few years ago, a GPS survey; I’m going to use most of their elevations. We have Laguna Verde at 4,380 meters this morning, that was 14,500 feet call it. And you know we had spent 6 nights above 13,000 feet as you’ve been following us down there acclimatizing and getting exercise climbing peaks.